I think that the treatment of this theme is very complex, not because it is complex by itself, but because it is very easy to fall in clichés and generalizations that we must avoid if we want to be real..
Every time that somebody asks me about the character of the fila, I try to make him understand that, if the fila have some qualities that are supposed to be common to the specimens of this race, each animal is a world and, in his final behaviour it is fundamental the education he has been given, the treatment he receives and a lot of other factors. The vital experience of the dog, as well as the experience of every living being, is basic in the upbringing of its character. 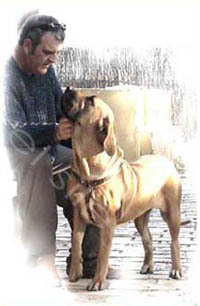 Obviously the experiences are not the only ones in creating the character of an animal, the genetics has its influence as well, but we can not assure that all the filas are going to respond to a standard behaviour, as the one mentioned in the standard, as not all the lineages and families have the same kind of temperament and the rule that says fierce male dog x fierce female dog = all the puppies are fierce is not true. Obviously that the selection of the character is a basic tool of the breeders to get good temperaments and we must be rigorous with the temperament control of those dogs that are going to reproduce , but we are not in a mathematic world and things are not so easy. The breeder or any other seller can not assure that his dog is going to behave this or that way, if he does not want to lie. 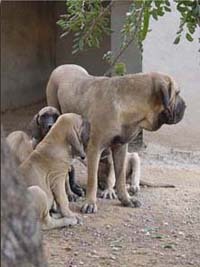 The Fila Brasileiro is a resistant and rustic race, usually courageous that will perform with efficacy the guard work that he have been told, but specially if he has been properly treated since his childhood. It is basic to give the dog a proper treatment since he is a puppy in an environment that allows him to develop his character with equilibrium. The animal needs the coexistence and the contact with the people that form his habitat. I always say that a fila confined in a kennel, will never be a dog from whom we can have all the qualities that this race can give us in other conditions; the isolation of the kennel, will usually result in a shy animal or a super aggressive one, if we breed a fila this way, only with difficult we can have a balanced dog, and we must remember that keeping a dog on the kennel, condemns the dog to stay there more and more time, as he has no opportunity for a suitable earning of the coexistence and he ends to be an animal that does not know how to behave among people, what, sadly will be resolved by in worst way: Taking him again to the kennel.. The fila is a dog that does not need training for his function of guard and protect, usually it is not necessary to stimulate the aggressiveness of the dog. These qualities for guarding do not always appear at the same age in each animal, there are those animals that show grudge when they are very young, while other dogs may show it later. Most part of the filas should have it developed when they are one year old, but in some dogs the maturity comes later, specially the females after being mothers or the males after inseminate a female dog, but these last examples are not the most usual. 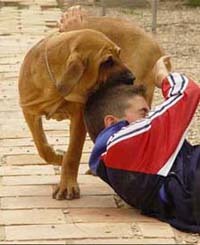 If you want to train the animal, it is basic not to do attack training before the dog is perfectly trained in obedience. This training must always be performed by the owner of the animal; you should never leave this matter in the hands of a stranger. It is very difficult for a fila to accept order from anyone but his owner, and it may even be dangerous if someone that he does not know tries to make him obey. This process must always be supervised by a professional and if it is possible, a knower of the race, what is not easy to find. I think it is not necessary to train a fila in attack and I am not in favour of doing it. Either I think that the Fila is a “school” dog, I do not think this is a race propitious for training exhibitions and for me it is enough with some basic notions of obedience adapted for the correct daily coexistence that you may easily execute because of the great will of the fila to please his owner, much more than other kind of learning intended more than anything else for the show off of the dog and his owner. I like to breed my dogs in a natural way and let their qualities appear the same way, without leading them. The fila is an animal that only develops a good character when he is well treated. As more affection he receives from his owner and as more time they spend together, bigger are his qualities of guarding and greater strength he shows in repelling the strangers. The contact with the owner is basic for the dog to develop a correct psychic balance. The closeness to other animals and persons make the fila a more sociable dog. It is important to specify that the fila is an exceptionally sensitive with is owner and does not welcome a bad treatment. If you beat him he may become a very fearful dog, and if you reproach him a lot, he may become an insecure animal. The space that the dog has to move himself in his daily life is also a factor of influence in his character. The filas breed in Brazil in big open spaces and in contact with the nature have calmer characters then those who live in reduced areas, this does not mean that they do not have the typical character of the fila, but only that we have a more peaceful animal. I had the experience of being in a “fazenda” with dogs living free among the cattle, moving around among the filas and having no problems with them (always in the presence of the owners). In a first moment I could have thought that they were a docile pack of dogs, but this is not true: they let me move by the farm but if I went closer to the cows corral or closer to any one of them or when I looked attentively to their eyes I just received a penetrating look and a grunt that let me with no doubts about the warning. And they never stop looking at me, following all my movements with detail. Unfortunately in Europe we can not easily find a kind of habitat as the Brazilian “fazenda” to breed our filas in freedom, and that is why we can not find here that kind of behaviour. There is also a consensus among the great majority of the breeders and that is that the fila, that has a great territorial control, will only attack a stranger detected inside the land they must guard, so the owners must not be afraid of taking then to the street, as the fila properly educated will not assault people outside of his home (if the people do not provoke him or try to touch him or his owner). Anyway I do not think prudent to go for a walk with a fila among the crowd or to a public place where the dog can be among strangers, without a leash, even if our animal is accustomed to these situations, as anything could happen that might trigger un attack. This is only a matter of responsibility. If you have a fila brasileiro, or any other race considered of guard and defence, forces us , as responsible citizens to adopt the necessary measures that make our dog, not a danger to other people. It is obvious that a dog with these characteristics needs to be maintained in an enclosure with a strong and secure fence high enough not to let the dog jump over it. Frequently people interested in the fila brasileiro, tell me their doubts or fears because they think that the fila may, in some occasions, be a danger for them or their family, and the most frequent question is if the fila accepts all the familiar unit. We can be calm about our fila in this matter; it is a race that can perfectly adapt to everyone that frequents the environment where he moves and will accept perfectly those he knows, even they are a numerous group. When a new member joins the familiar unit and the dog doe not know him, you need to in a appropriate way and be careful the first days, avoiding to let this person alone with our fila and bringing about the moments when dog and the new person may be together; obviously, this one must win the friendship and confidence of the dog with food, nice words and strokes when the dog accepts them; after some time, which is changeable from some specimen to others depending on the bigger or smaller aggressiveness and suspicion of the dog, once the new member is accepted by the dog there is no way back. The fila is an animal of great nobility and fidelity that, once he gave his affection to someone he does not take it back again. They also ask me about the capacity of the fila to coexist with other animals. During the first month of his life, all the animals go through what is called the imprinting phase, when the animal becomes accustomed to every thing that makes up his habitat and accepts it absolutely without any kind of problems, this is not new, we all know dogs that coexist with cats, birds, rodents, monkeys and so on, and behave with them with affection; in this matter the fila is like any other dog. The same way, the puppy that shares his life with other dogs will always coexist with them without any big problem. In the case of the fila this is true as well, although sometimes there are some problems and we must know how to behave with them. The problems between filas usually became because of jealous, that is why we must be very careful in not to favour one of them on all the others, as this might create a resentful dog and a source of conflicts (I always remember the case of one of my dogs, a female, that every time I went for a walk with any of my other filas and she was not coming, she always gave a good trashing to the “privileged”, that is why I decided that she must always be a part of the group that left for a walk). In everything else the filas behave like all the dogs in the nature, the hierarchical order is basic for the good work of the herd, there is always a dominant animal, usually a male, although sometimes this does not happens and there are some occasional fights for this leadership that usually are not fatal, although sometimes there have been some fights between filas with dramatic consequence for one or both of them. This coexistence among several filas is possible if we have a very large space, as I said before, the aggressiveness is inversely proportional to the space the dog has to live. We remember that in the Brazilian fazendas the fila has always lived in numerous groups in freedom. Actually, I always keep my dogs always free and in groups where they coexist in peace and I have seen them in other breeders in numerous groups coexisting in harmony. To keep the harmony in a group of filas is not the easier work we can have but it is not impossible and, with patience we can do it. Another usual question is what happens with the visitors, what to do with the fila with them. Here we must say what we said before: it depends of what your dog is used to since he arrived at your house. If, since the beginning we use our puppy to be free when we receive our visitors and we allow him to stay close to them and receive their stroke, when the dog is adult will accept this possibility; most part of the cases, this dog can be an adult with whom it is possible to share the moments with visitors in our home without any risk. Other owners will prefer that their filas are more suspicious guard dog and reject with aggressiveness everyone close to their house; in these occasions you should reduce the contacts with unknown people and when these should enter our garden or home, there must always be a kennel where to put our dog until the visitors are gone. To have a kennel where to put our dog is always advisable, because this is better than be always rejecting or quarrelling the dog not to come close, as that would be disconcerted and painful for him. The other great worry of the new owners of filas is children. This race accepts without any kind of problems the kids of the house becomes their most devout guardian and develops with them a patience and attitude almost unthinkable, allowing them everything without a displeasure gesture. I had some experiences that express it and I had as well a lot of phone calls from people that bought me a fila in some moment, bringing out the behaviour of the fila with their children whom they protect in a special way and with great zeal, they allow the children to ride them and another thousand of things that children do in their games and the fila enjoys in a special way. Perhaps one of the most curious scenes that I saw was the one of a female fila playing in the garden with the three children of the family, all of them very young, the dog was standing up, the smaller of the boys that was crawling around, got hold of the dogs tongue that was hanging out while she panted because of the heat, and used it to stand up; In all the time that took the child to do this the dog did not the smallest movement to avoid it, and I suppose that this should have been very painful to her. Anyway, I think that, if children are very young they should not be alone with a dog, not only a fila, but any dog of any race of a considerable size, as sometimes children play pranks with the dog that might hurt him and the animal could, even only for a natural defence instinct, hurt them, and we shall not forget that a bite from a fila, without any other intention but protect himself or making a warning, not with the intention of harm, is very powerful and might have important consequence. A different case is how does a fila reacts with children that do not belong to the family: Filas usually accept children even if they do not know them, they usually do not show any kind of aggressiveness against them or allowing them a rapprochement they would never allow an adult, however I always recommend that the children of the house should never be left alone with the fila when receiving the visit of little fiends that the dog do not know, as if the normal is that the dog accepts them, it is possible that when the children are playing they fight among them or they may have a abrupt movement or they may cry and the dog might interpret that someone is damaging their “little friend” and, in this case, he might attack. This is a risk that we should never take. Many people were interested by the fila, attracted by the “great feat” told by some breeders in magazines or books about the race and the promises that they were going to have a terrible guard dog at home with anything to envy to the mythological Cancerbero y it happens that those people by a puppy whose breeder assured them that he was going to be a “torrent of fury” and they hope that at 3 moth of age the puppy fulfils all the expectations they had. This is why there are so many consults from owners disconcerted by the behaviour as their dogs that shows insecurity or do not do anything to the visitors. First of all, any breeder half honest can make a sell assuring that the animal is going to be a great guard dog, because as I said before, the fila character, besides of the genetic component (that gives us great possibilities, impossible of predicting) is a result of his vital experiences; in second place the fila is a race where the puppies have a irregular behaviour. It is not difficult that some specimens that have a good fila temperament in their maturity are, in some way, insecure when they are young, the character is not yet fixed and we can find that one day the puppy allows that a visitor enter the house without doing nothing and next day he repels another barking, and later on he will sniff another visitor or he looks for the caresses or wants to play with the next one. During the first year of life, a fila is nothing more then a fila “in formation” and his character is being built; the puppy his always trying new things, he makes “guardian rehearsals”, he is curious and tries to investigate new people around and he has, at last, a childish behaviour. However, these characteristics that will make him, in the future, a good guard dog start to timidly appear; you just have to give him self security, encouraging him and awarding him these first attempts of repelling the strange people and having the patience you need to help him to convert in our guard and fellow. I hope that these remarks (although apparently very simple, they are the doubts that always present those who are interested in our dogs) help the owners and enthusiastic of the fila brasileiro to know this magnificent race better and to enjoy these fellows. I think that it is as well convenient to demystify the character of the fila that, if it is true that is an aggressive and temperamental race and an excellent guard dog, he has been surrounded by a “lethal weapon” aura that does not benefit him or make him justice. There is nothing esoteric in the education of a fila, anybody can make from any specimen of this race, the dog he wants. Jaguá del Silendín compartiendo un rato de juegos con DIego. El Fila con temperamento fuerte, al tiempo puede y debe ser bien equilibrado. Un fila bien equilibrado no debe atacar nunca sin motivos, pero lo hará con firmeza y valentía cuando la ocasión lo requiera.